MAY’S BREXIT PLAN IS CRUSHED, BUT MAY SURVIVES IN OFFICE: WHAT NEXT? Events in the United Kingdom regarding its Brexit from the EU are happening quickly. As I’m sure readers know, Prime Minister Teresa May’s Brexit deal negotiated over almost two years with the EU leadership came to a decisive end in the House of Commons when it was defeated by a resounding 432-202 vote (first link). 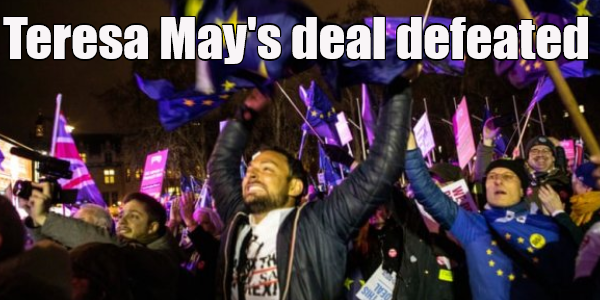 The long talks and negotiations between May’s government and the EU leaders proved to be a complete waste of time as that deal was crushed in the British Parliamentary vote. I think everyone who was following this story was expecting this deal to fail, but the margin of its defeat was surprising. Indeed, there were reports of EU leaders being “horrified” at the deal’s crushing defeat (second link). Other reports I’ve read describe EU leaders as being “stunned” by the outcome. Even so, the second link indicates the EU’s first reaction was not to renegotiate the deal. If that remains the EU’s position, then the odds of a “no deal” Brexit on March 29th have risen considerably, no matter what happens in the United Kingdom. The default reality is that unless both the UK and EU approve a new deal of some kind, there will be a no-deal Brexit on March 29th. Trying to take advantage of the crushing Brexit deal defeat, British Labour party leader, Jeremy Corbyn, quickly called for a “no confidence vote” to be considered in the House of Commons (third link), and this motion was debated and defeated the very next day, albeit by a very close 325-306 margin (third link). It may surprise some global observers that May could be crushed in her Brexit deal vote, but win a “no confidence vote” the very next day. This has an easy answer. Corbyn wants to be Prime Minister, but that would require new national elections in the UK. That would only have happened if May had lost Corbyn’s no-confidence motion, but even those in May’s own Tory party who helped crush her Brexit deal are horrified at the prospect of Corbyn becoming Prime Minister so they stuck with May whatever her flaws. Former British Foreign Secretary, Boris Johnson, who helped lead the anti-Brexit deal winning side, was quite clear that he would support May instead of Corbyn as the Prime Minister (fourth link). He also stated his advice to May that she now go back to the EU and negotiate a realistic Brexit deal that is far more favorable to the UK; however, he also acknowledged that the government had to make preparations for a no-deal Brexit on March 29th (fourth link). Where does this process go from here? There are several options, but two of the principle options that have been discussed to date are now “off the table” due to this week’s votes in Parliament. There will be no Brexit deal as negotiated by May and the EU, and there will be no new national British elections before the March 29th Brexit date. The primary options at this point are (A) preparing for a no-deal Brexit on March 29th, (B) negotiating a new Brexit deal or asking for an extension of the Brexit deadline with the EU, (C) holding a new Brexit referendum in the UK or (D) having the UK adopt a relationship with the EU as is currently held by Norway, Iceland and Lichtenstein. Let’s consider these options. The EU is now clearly making preparations for a “no deal” Brexit on March 29. The EU has proposed to the UK a multi-point deal for the post-Brexit period that would allow air and surface traffic to continue largely unchanged, allow financial transactions to occur unhindered and allow the UK and EU citizens living in each other’s respective jurisdictions to continue enjoying their current rights and privileges (fifth link). I found the EU’s list of proposed transitional measures to be entirely reasonable, and it is clear that no “chaos” would result if they are adopted by both the EU and the UK. Even the manager of the EU’s port at Calais (through which much of the EU-UK commerce passes on trucks/lorries) expects no meaningful difficulties or interruptions in truck traffic between the EU and the UK if a “no deal” Brexit occurs (sixth link). The UK and the EU nations are all WTO signatories, so their commerce would simply be regulated by WTO rules instead of EU rules. It is especially worth noting that the EU’s list of transitional measures includes “preventing] disruptions in the clearing of derivatives” between UK and EU banks (fifth link). Many laymen will read right over that, but this provision is actually crucial to avoiding a collapse of the global banking system. If counterparty relationships between major UK and EU banks broke down, it could trigger a global banking and financial collapse. This fact alone argues that some kind of deal or transitional arrangement must be reached between the EU and UK as the UK leaves the EU. The EU so far sounds very unwilling to negotiate a new Brexit deal, but if May makes it clear that the House of Commons will not approve any “$39 billion” divorce agreement payment from the UK to the EU without a new deal that could rivet the attention of the EU to a new reality. The EU is also holding new EU parliamentary elections in May and it needs to know whether UK will have slates of candidates running for EU seats before that campaigning begins. This fact alone makes it very hard for any extension of the Brexit deadline to occur. A new Brexit referendum in the UK is possible, but there is little time remaining for such a vote and both May and Corbyn has been publicly opposed to such a thing happening so one or both of them would have to publicly make themselves a liar to promote such an option publicly. Also, if a second referendum was held, it would set a precedent that the globalists will never accept any nationalist vote of the citizens of any nation but will require repeated votes until the people did what the globalist elites demand of them. Such a brazen totalitarian act by the elites would likely embolden and stimulate a large wave of nationalist fervor all over Europe just as the EU’s own parliamentary vote is about to be held–this is something the EU elites definitely want to prevent. Another discussed possibility is that the UK adopt a relationship to the EU similar to that of Norway. Norway is not a member of the EU, but it has favorable commercial and trade ties to all EU nations even as Norway retains its sovereignty and selects which EU trade rules it wishes to implement within its borders (see seventh link and eighth link). This option was rejected by the EU when it thought it would get the British to accept the Brexit deal (or “surrender”) that it wanted to impose on the UK via Teresa May. It may now look better than a no-deal exit at this point. An analysis by FoxNews (last link) argues that the “no deal” option is actually the best option for both the UK and the USA, and that analysis makes good points. I think it is clear that the shrill screams of those who warn that a no-deal Brexit will bring about an apocryphal chaos all over Europe are severely overwrought. In looking at this from a biblical perspective, I consider the applicability of a prophecy in Genesis 49 to the current situations of both the UK and USA. Genesis 49:1 states that this chapter contains a prophecy about the destiny and/or national characteristics of all the latter-day nations/tribes which would be descended from the patriarch, Jacob, whose name was changed to Israel (Genesis 35:10). The prophecy for the brother tribes of Ephraim and Manasseh (the sons of “Joseph”) is given in verses 22-26. It foretells that the latter days would be a time when the descendants of these two tribes would enjoy a special outpouring of the “birthright blessings” that were first promised to Abraham, Issac and Jacob/Israel. These blessings include national wealth and all kinds of national blessings. This prophecy also foretells that these tribes would be “hated” and either “attacked or harassed” (depending on the translation) in the latter days. However, it also prophesies that when they are hated and attacked/harassed, God would strengthen them against their rivals. Those who have read my books or listening to my audio messages at the “speeches” tab at my homepage know that the modern nations of the tribe of Ephraim are the British, Canadian, Australian and New Zealander peoples. The American nation represents the modern tribe of Manasseh. These nations have enjoyed the lion’s share of national blessings for at least the last 150 years, fulfilling the prophecy of Genesis 49:22-26. They are also a group of nations and a single great nation with “brother” cultures, fulfilling the prophecy about Ephraim and Manasseh in Genesis 48:14-21). It is interesting to note that in the prophecy of Genesis 49:22-26 about the tribes of Ephraim and Manasseh in the latter days that there isn’t the slightest hint that either tribe would lose the birthright blessing at any time during the latter days. Indeed, verses 22-24 argues that God will intervene in their behalf to make sure they are not robbed of the birthright blessing in the latter days. As 2016 dawned, it looked like the British nation would be subsumed into an EU that was ruled by unelected elites and it appeared Hillary Clinton would win the American presidential election which would have subsumed the USA into a globalist-dominated world order. The globalist plans for both nations went off the rails when the British unexpectedly voted to leave the EU in the Brexit vote and the Americans unexpectedly elected the nationalist/anti-globalist candidate, Donald Trump. The globalists have “harassed” these outcomes ever since, trying to reverse the Brexit vote via May’s “deal” that would have made the UK more subservient to the EU than ever before, and via endless investigations and allegations vs. Donald Trump (while ignoring the many alleged corruptions of Hillary Clinton and the American Deep State globalists). Could it be that these globalist efforts to pull the UK and USA back into subservience to the global elites’ agendas have failed due to divine guidance of all outcomes? Atheists would scoff at such a conclusion, but it is entirely logical from a biblical/spiritual perspective. It is not yet clear what the final Brexit outcome will be, but it is clear that the effort to make the UK essentially a colony of the EU via Teresa May’s deal failed miserably. The British were delivered from that fate. For more information on topics discussed above, please read my free articles, Are We Living in the Biblical Latter Days?, The Tribe of Joseph in the Latter Days and The USA in Biblical Prophecy.